As I was planning my trip to Washington, DC and Baltimore for the Washington Automotive Press Association’s EV Day at the Washington Auto Show, an e-mail came from a public relations representative from Audi. It was an interesting pitch regarding the expansion of their vehicle-to-infrastructure technology that includes Traffic Light Information and Green Light Optimized Speed Advisory features. I’ll admit that, at first, I ignored it. Then, she followed up with asking if I would like to try out the technology. Eventually, the discussion turned towards this trip to Washington. Therefore, I was scheduled an Audi Q5 for the purposes of experiencing this advances technology. Before I go off the deep end of driver assistance technologies and the brass tacks of vehicle-to-infrastructure technology, there is a vehicle to discuss here. A very important vehicle for consumers in higher income brackets who simply want a compact SUV to roll around comfortably in places, such as Washington, DC. The Audi Q5 is a competitive vehicle. It is laden with technology and luxury that we expect from an Audi. It is also the brand’s high-volume seller. If you are looking for a full technological review of the aforementioned features, we accomplished this through a collaboration with William Hopper of Queer4Cars. You can read and watch our impressions through their channels (and another channel I write for). However, I want to focus on this status symbol among premium compact SUVs. Let’s face it, technology stuff bores you. You really want to know how the Q5 stacks up in a highly competitive segment where the upwardly mobile play. 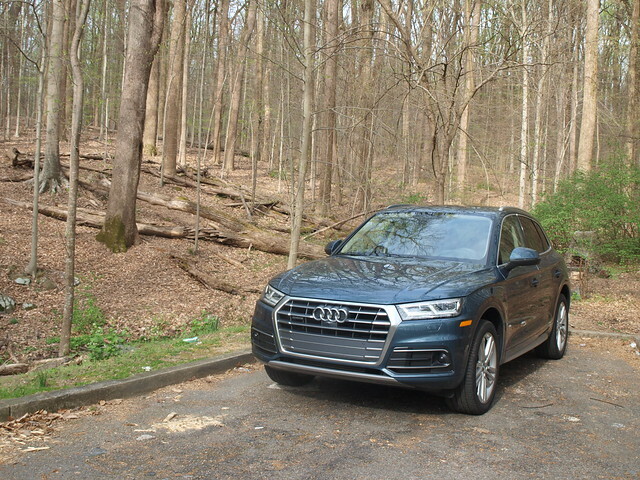 The latest Q5 follows plenty of Audi design conventions: large grill, satin-chrome finishes, integral headlamp units housing multiple bulbs, a semi-fastback roofline, LED tail lights and concave license plate area. While it follows convention, it exudes an air of luxury that befits its place in the automotive universe. Audis are simply no longer understated. There are a few things that are truly enjoyable about the Q5. The rear liftgate opens wide, which helps in loading wider items. The doors open equally wide, but rear door openings are just right. Our tester came with equally handsome and luxurious 20-inch wheels, part of the Prestige package. In all, the Q5 is unmistakably distinctive and absolutely easy to the eyes. Where the Q5 stands out is the interior. It is not about the layout or the seats. It is also not about equipment levels. The big win for the Q5 is the level of quality of the materials used throughout the cabin, the controls and the readouts. The first thing that will jump out inside is the Virtual Cockpit: a full TFT screen that is customizable and easy to read. The instrument binnacle is anchored by two dials—the speedometer and tachometer—where the middle part of the screen can give you any bit of information or facilitate any settings you make for it. In comparison to other vehicles in its class, this is the best instrumentation setup of them all! The seats in the Prestige package are made of durable leather in Atlas Beige is sporty and luxurious. Front seats offer proper bolstering while providing a balance of support and comfort. The rear seats are fine, but leg room is a bit short. Making things interesting is a high transmission tunnel giving a center passenger a challenge to fight for foot room on either side. 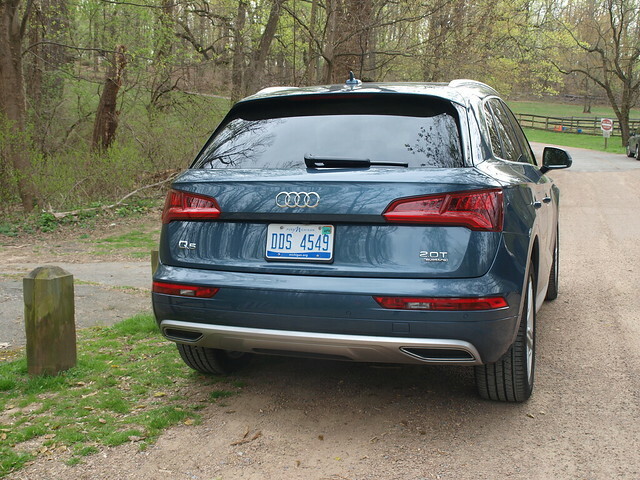 The Q5 is really made for four adults, which in many cases are just fine. Rear cargo space starts off with 26.8 cubic feet behind the rear seats, expanding to 60.4 cubic feet through to the back of the front seats. The tablet-like infotainment screen that sits on top of the instrument panel is controlled by the MMI knob on the center console. Once you get through the sequence of screens through the knob, it becomes almost natural. The word here is “almost,” because the MMI system can also connect to your smartphone via Apple CarPlay or Android Auto. One thing to keep in mind is that it is not a touch screen system, therefore you must use the knob to control your smartphone functions. The good news is that the response from the MMI knob is very quick, which you can go from smartphone screen to the MMI interface with a couple of turns. Once you have everything settled through the MMI system, sit back and let the 19-speaker Bang & Olufsen system with 3D sound entertain you. With a 16-channel amplifier and 755 watts of power, you will indeed rock your Q5 like your own personal dance club. 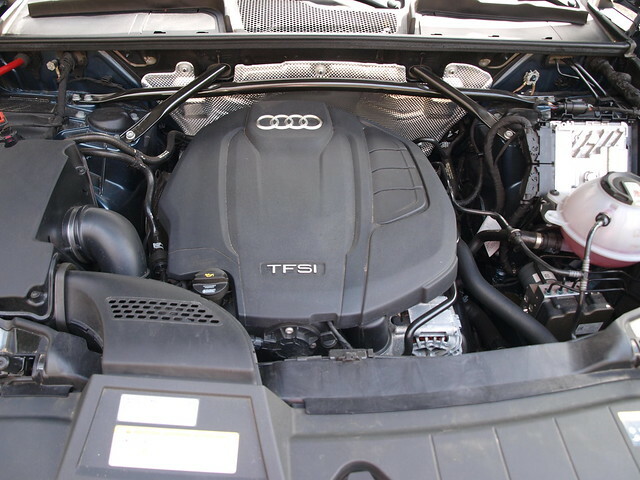 Powering the Q5 is a 2.0-liter turbocharged four-cylinder engine putting out 252 horsepower and 273 pound-feet of torque. Connected to the superb engine is a seven-speed S-tronic transmission channeling power to all four wheels with Audi’s signature quattro all-wheel drive system. It is a solid engine that likes to chill and get motivated, depending on how much pressure you put on the accelerator pedal. It will also return decent fuel economy. My average was around 22.0 MPG in traffic between Northern Virginia and the District. The Q5’s driving manners are just fine. The ride quality is good, and it does its best to keep things even over bumps and rougher surfaces. Handling is superb, as it handles turns and evasive maneuvers very well. The brakes are great in every condition, including winter stops. Pedal feel is terrific, as expected in an Audi. Steering is also quite good, giving us tight turns and great response from the wheel. Active safety is also a strong Audi trait, as its suite of features made for better driving in our care. This included adaptive cruise control, lane departure warning, blind spot monitoring, rear cross-traffic alert, and a 360-degree camera. There is also a semi-autonomous feature that allows you to drive with your hands off the wheel for a brief moment while maintaining a location within the lane. There are two cameras positioned where the fog lamps would normally go that facilitates this feature. The 2018 2.0T quattro with the Prestige trim model provided for the V2I technology testing came with a sticker price of $55,500. Model year 2019 Q5s start with a base price of $42,950. Think about this for a moment: This is one competitive segment. The Q5 has plenty of company from not only Germany, but all over the world. What makes it stand out is not just the four-ringed logo found all over the car, but of a level of substance that attracts customers to this popular SUV. Would you consider an Audi Q5? That would be entirely up to you. It is worth considering, if you are looking in that specific segment. 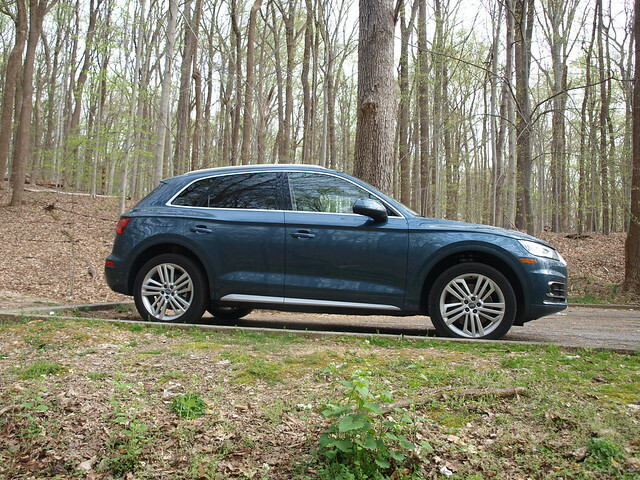 No matter if you live in the DC area or elsewhere, the Audi Q5 should be on your shopping list.